Can your wall art photosynthesize or organize? It can if it’s Urbio. 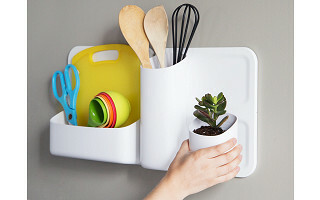 These minimalist, wall-mounted organizers turn plants, mail, craft supplies, and whatever else you wish into a tidy, eye-catching vertical display. 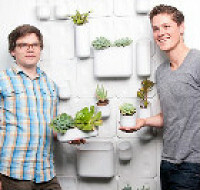 Created by Beau Oyler and Jared Aller, Urbio sprouted from Jared’s desire to grow plants and herbs inside his small city apartment. Vertical gardens are used everywhere from homes to hotel lobbies, and having a natural “living wall” in your space is bound to brighten it up. Imagine moss, succulents, and flowering vine plants adding color and texture to your wall. Or having an herb garden within arm’s reach of the kitchen. 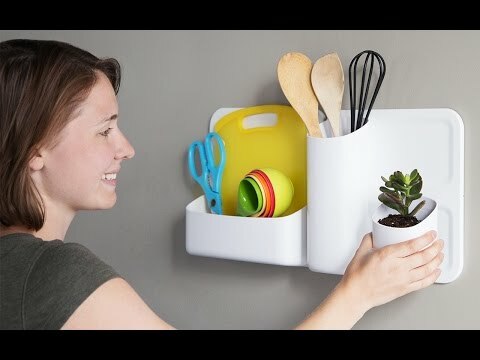 Or, if you’re missing a green thumb, keeping papers, magazines and more handy with an aesthetic appeal. Urbio is easy to set up and to reconfigure as you wish. The plates fasten directly to the wall, then the movable containers connect to the plates with large, neodymium magnets. With various-sized pots, you can regroup and rearrange until you have just the right composition. Hi Daily Grommet, I'm Jared Aller, a designer from Oakland, California. I designed a product called Urbio with my business partner Beau Oyler and our design team at Enlisted Design. Urbio is a magnetic, modular system that attaches to any wall. 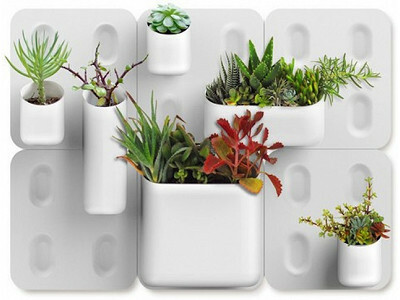 Originally designed to grow plants indoors, Urbio can store anything in its magnetic pots. The wall plates allow Urbio to be as big or small as you want and the magnetic pots give you the freedom to move your vessels around. I'm here to answer any questions you may have, so fire away! Is it possible to buy the pots individually? I have a stainless steel fridge that is exposed on one side, and I could fit lots of these little guys in an herb garden right on the fridge. Yes, looks like that would be a great spot for these! Right now we are not selling them individually, but we'll be sure to update the site if that's an option in the future. Let us know how you like them. Is your product available at any stores in Canada. I would love to see them before I pay out money. To be able to plan a space is very hard to do on line. Sorry but even though I am very interested in some for myself and my mother who is in a home, and would love to have a couple of these I refuse to pay money for something unseen.. Get them into stores in a hurry, because it is a great idea. You can see them in person at EQ3 in Canada. They have a great display! If I want to purchase your product where can I buy it? You can Buy them right here on Daily Grommet! this is a wonderful item to grow herbs on the fridge!!! please let me know as soon as the items will be sold separately..mainly the pots.. so i can start my herb garden. i would love to purchase the big family option, but right now i life i find it cost prohibitive. excellent product!!!!! Glad you like it! Someone else was wondering the same thing. We'll be sure to update our community if that option becomes available. @Amy Bernstein I wanted to know that as well. If they stick to metal the things you can do with is endless. I really want to see them do that. Can your wall art photosynthesize or organize? It can if it’s Urbio. 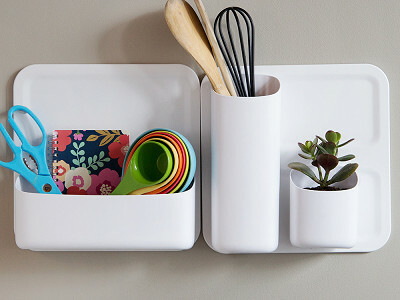 These minimalist, wall-mounted organizers turn plants, mail, craft supplies, and whatever else you wish into a tidy, eye-catching vertical display. Created by Beau Oyler and Jared Aller, Urbio sprouted from Jared’s desire to grow plants and herbs inside his small city apartment. Vertical gardens are used everywhere from homes to hotel lobbies, and having a natural “living wall” in your space is bound to brighten it up. Imagine moss, succulents, and flowering vine plants adding color and texture to your wall. Or having an herb garden within arm’s reach of the kitchen. 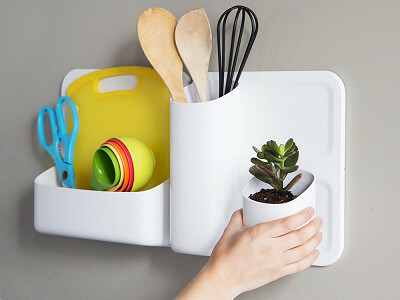 Or, if you’re missing a green thumb, keeping papers, magazines and more handy with an aesthetic appeal.